Yorkshire’s Nick Wall powered into the quarter-final of the British Junior Championship 2018 Boys Under 19s as the three-day event saw lift-off across Nottingham. The 18-year-old from Sheffield overcame  Jack Mitterer (Kent) 11-5, 11-8, 11-7 to book his place in the quarter-finals, where he will face Welshman  Lewis Poole. 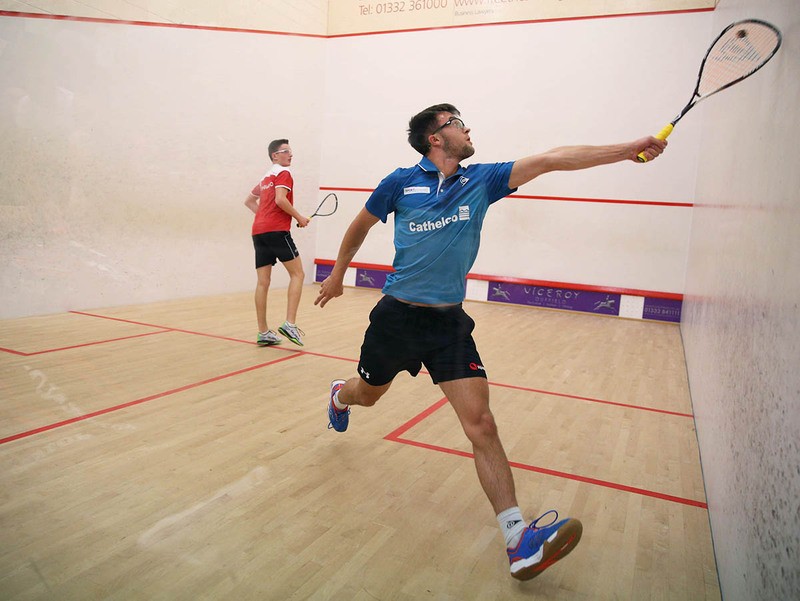 The result means top seed Wall remains on course to amend the BU19 heartache he suffered at last year’s tournament, when he finished runner-up to Tom Walsh (Sussex) at Manchester’s National Squash Centre. And following his straight-game victory, the teenager is relishing the opportunity to do battle with Poole in an intriguing first match-up between the pair. “It’s good to get a match under my belt and I’m happy to get a three-nil win – it’s always nice to get that in the first round,” said English Junior BU19 champion Wall. “I’ve tried to keep it quite light this week so I’m fresh going into the tournament. “I’m feeling confident going into the quarters, I’m playing well. “I haven’t played Lewis before as he’s from Wales. Wall's triumph was an exciting glimpse of the hot crop of home talent gracing the junior circuit – some of whom are already impressing on the senior stage. Elsewhere in the BU19, Wall’s fellow Yorkshireman  Ben Sockett also booked his place in the last eight, where he will face last year’s BU17 champion, [3/4] Lewis Anderson (Warks). Fourth seed Alasdair Prott – one of three Scots to be left in draw – will lock horns with  Joshua Owen (Warks) while  Kai Bentick (Middx) faces  Samuel Gibbon (Durham & Cleve). In the GU19, two-time BJC winner and top seed Alice Green (Essex) cruised into the last eight after overcoming  Megan Thomas (Hamps) 11-4 11-5 11-7 to tee up a tie with  Brieanna Boo Burki (Surrey). “It’s always an enjoyable game against Megan and I’m now looking forward to my match tomorrow,” said 17-year-old Green, whose successful year on the court has seen her chalk up an impressive PSA ranking of 122. It is a strong quarter-final showing from Essex players, with  Amy Aspinall,  India Webb,  Piper-Rose Tatum all progressing. But hot on Green’s heels is Scotland’s  Georgia Adderley, who saw off  Phoebe Colman (Surrey) to draw Ireland’s  Sophie O’Rourke in the last eight. Meanwhile, Yorkshire’s Sam Todd marked his debut in the BU17 with a straight-game victory over Sion Evans (Wales), then dispatched Daniel Haggarty (Warks) in three to set up a quarter-final showdown with Scot  Andrew Glen. “I felt very comfortable during my match and kept my consistency throughout,” said Todd. “I’m feeling very confident going into the quarters and I’m hoping for a good performance. The two-time BJC winner will be joined by  Franklyn Smith (Sussex), who faces  Adam Goad (Cumbria). Sixth seed Hassan Khalil (Warks) will do battle with  Max Forster (Nbria) and  Toby Ponting (Hamps) will face  Billy Miles, among the other last-eight matches. In the GU17,  Maia Pannell (Hants) safely progressed to play Scot  Lucy Murchie, while second seed Margot Prow (Middx) will face  Amy Pullen (Bucks). Intriguingly, players from a total of 11 different English counties will feature in the GU17 last eight – a testament to the wealth of talent across the country. In the BU15, Ireland's Denis Gilevskiy  remains on course to earn consecutive BJC silverware, with the European number one cruising into the last eight, where he will meet Welshman  Lewis Daniel. Second seed Jonah Bryant  faces  Ashley Hughes in a crunch all-Sussex encounter, while  Finlay Withington and  Ben Beachill will battle it out in a Lancashire-Yorkshire contest. The GU15 will see top seed Asia Harris take on  Layla Johnson in an all-Yorkshire tie, while  Torrie Malik (Sussex) will play  Amy Royle, also of Yorkshire. Meanwhile, Torrie’s younger brother  Bailey safely progressed to face top seed Yusuf Sheik (Essex) in the BU13 while the top GU13 seed, Hampshire’s Amelie Haworth, will face Scot  Robyn McAlpine. And a year on after it was introduced at the BJC, there were no major upsets in the Boys Under 11s, with top seeds Ronnie Hickling (Surrey) safely progressing through to the semi-finals. View the draws and results via Club Locker.